Doberman Pinschers are a medium-size dog known for their elegant appearance, endurance, and speed. The breed dates back to the 1890s, and Dobermans have a history as both guard dogs and police dogs. Because they were originally bred to be protective, Doberman Pinschers are fearless and are wildly stereotyped as aggressive animals. Despite their potentially aggressive nature, Doberman Pinschers remain popular pets today due to their loyal, alert and intelligent nature as well as their protectiveness. When properly trained, Doberman Pinschers can be loyal defenders and yet also respectful of their humans. Unfortunately, many are not properly trained and, although they rank low on the scale of owner-directed aggression in a study of Breed Differences in Canine Aggression, they rank high on the scale of aggression directed at strangers. Unfortunately, an aggressive Doberman can do serious harm to an innocent victim if the dog decides to bite. If you or a loved one has been the victim of a Doberman Pinscher attack, you need to seek legal assistance to understand and protect your rights. 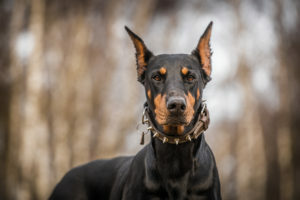 If you are bitten by a Doberman Pinscher, the bite can have significant health consequences. In rare cases, an attack can lead to death, especially when a child is attacked. In other instances, however, an attack by a Doberman Pinscher may cause broken bones, bruises, cuts, or even scarring and disfigurement. It is even possible to suffer brain injury as a result of an attack as the Doberman could knock you over or you could be thrown backwards during the course of the struggle. When you do suffer injuries as a result of an encounter with an aggressive and dangerous Doberman Pinscher, the dog’s owner may be held accountable to you for your losses. A dog bite attorney can help you to understand what types of damages you may be entitled to claim and can assist you in taking steps to protect your rights. At Simmons and Fletcher, P.C., we understand that the consequences to your health may not just be physical but may also be emotional as well. We know how much harm a dog bite can cause, and we will do everything possible to fight for your rights. Call us to discuss your Doberman Pinscher attack case today for no charge: 1-800-298-0111.